Let me guess, the last post in you Google Classroom was done the day before the exams started? Yes. How do I know? Because that used to be me too. I would post every day during the term, but once the exam started, the kids were on their own. I did not even open Google Classroom. But this year I realised that there are ways that you can use Google Apps to improve your exam game. Today I am sharing my 4 favourite Tips and Ideas for using Google Classroom during exams. As a high school maths teacher, we always joke that we do not bother to teach things that we will not ask in the exam. So giving learners a demarcation for the exam seem to be unnecessary. You want to know what to study? The answer is everything! But a couple of years ago we started to provide learners with exam guidelines. These demarcations are not really about eliminating topics; the aim is to give students a grip on their studies by providing a checklist. Teachers often underestimate how daunting learners find it when they sit with their textbook in front of them, and they have to study “everything”. By providing them with a simple checklist, where they can tick of each topic as they study it, they feel a slightly more in control. But what does this have to do with Google Apps? Teachers often complain that parents should be more actively involved in their children’s studies, especially when it comes to exams, but more often than not parents have to rely on their child involving them. By taking our exam guidelines one step further and sharing it with both learners and parents, we are giving parents an opportunity to be more directly involved in the exam. 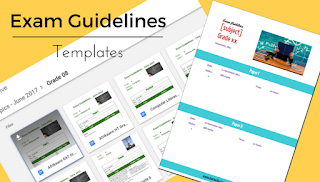 Using Google Drive’s sharing function make it easy to share the Exam Guidelines with anybody. Create a template for the teachers to use to create a professional and uniform look. If you sign up for my NEWSLETTER, you will receive a template to use for free!!! How about that? Sign up for the Butterfly Classroom Newsletter here. Add the template to your custom domain templates. Let every teacher create a guideline for their subject and share the documents with the person who is responsible for the Exam Guidelines. Consistently rename the files and create subfolders. Email the link of the folder to parents and learners. Reuse the same folder every year, only change the content, that way parents and learners already have the link. It may be because I am a maths teacher, but typically I would spend at least one afternoon during the exam helping kids who are struggling. The problem is that only kids who live near the school that can take advantage of this opportunity. So I have been experimenting with different versions of online revision. Two of which work quite well. If you have are unfamiliar with Hangouts, think of it as Google’s version of a group Skype. All you have to do is post the invite to the Hangout on Classroom, and during that hour any learner can join the conversation and bring their questions, and everybody can benefit from it. My biggest problem was that I would do a lot of calculations that I want the kids to see. Hangouts do have a nice share-your- screen feature, but since nobody can do maths on a computer (in my opinion), I have found that hosting the Hangout from my phone works best. When I want to show them my calculations, I just turn the phone around. Not pretty, but it works. At the end of the session, I take photo’s of all my solutions and post that to Classroom as well. If live videos aren’t your thing, you could try to create a Q&A post on Classroom where learners can post their questions, and you come back with answers. You could even combine the two. Classroom has a new feature that allows you to post short video clips directly from the Classroom app on your phone. Whenever my kids write an exam, I try to be there when they finish writing. I love hearing first hand how they experienced the paper. But more often than not, something comes up and I miss them, or if I do get to chat with them, I end up getting feedback from only one or two. And the feedback is always slightly coloured. Nobody wants to be the one who says the paper was tough when everybody else thought it was easy. This year I have started to post a Classroom Question, asking them how they found the paper. I just love getting their feedback, even from the ones who never speak up in class. It opens a new window into their maths experience, and I don’t actually have to do much. I use the same question for all my classes, so all I need to do is repost the Question from one of the other classes and voila. Before G-Suite came into my life, I used to create bar graphs for my learners, manually. Since Google Classroom came into my life, I can create the sheet exactly the way I want it and make a copy for each learner to complete. More often than not learners are oblivious to their strengths and weaknesses. Having a visual representation of the topics where they did best and worst in, make such a difference when it comes to planning their studies for the next exam. It also helps extra maths teachers and tutors, who do not get to see the exam paper, to know which areas to focus on. The Review Sheet consisted of three parts, a table and chart of their marks, some leading questions on study methods and an action plan for the future. Reusing last year’s review has the added bonus that I only had to make some small tweaks and voila I have a ready-to-use tool. I know everybody always talks about the fact that integrating technology takes lots of time – and they are entirely correct, it is a very time-consuming process – but once you have created the tools, it can also save you a lot of time. To give you a bit of a leg up, you can download my Exam Review Freebie here, and you will get my monthly newsletter as a bonus. Just adapt it to your subject, and you are ready to go. This year I am planning to take my review sheets one step further and ask learners to share their sheet with their parents. Since exam papers never go home, most parents have no idea of their child’s strengths and weaknesses. As a side note, you might be wondering if it would not be better in the long term to let learners create their own graphs? That way, they learn computer skills as well. And you would be right. But it is also true that even though I am good with spreadsheets, it took me a couple of hours to create a sheet and graph in exactly the way I want. Not only do I not have a couple of hours with my learners to create spreadsheets, but it is very inefficient for 30 people to spend an hour creating the same spreadsheet. And even though the kids did not learn how to create the graphs themselves, several learners have come and asked me at a later stage to help them create graphs for other projects.